Aussie’s turbo lance cuts cleaning time by half, saves time, water and energy. 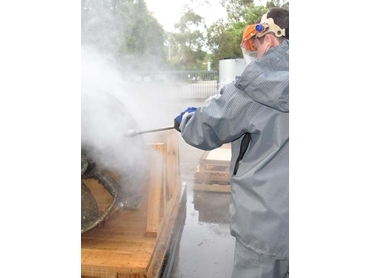 High pressure water blasters manufactured by Australian Pump Industries are built tough to meet the heavy duty requirements of end applications as well as challenging operating conditions. When equipped with a turbo lance, Aussie’s high pressure water blasters dramatically improve their performance by up to 100 per cent by doubling both speed and cleaning power. “We built the first 4,000 psi machine in the country, built in production line capacity and I remember testing it first with the standard nozzle and then with a top quality German turbo lance,” said Aussie Pumps’ Operations Manager, Hamish Lorenz. “The difference in performance was daunting,” he said. “Twenty years ago nobody was particularly conscious about safety and I remember wearing my sunglasses while we chopped up pallets with the 4,000 psi machine and turbo. We thought it was astonishing,” said Lorenz. The turbo lance functions by taking a pin jet, the most concentrated force in any pressure cleaner and multiplying its effectiveness and range by spinning it as it goes through the head. According to Lorenz, Aussie’s top quality German turbos outlast others and are either in brass or stainless steel configurations. The brass versions are all supplied with a rubber bumper to prevent damage when dropped. The turbo lance is ideal for stripping paint off walls and can save a huge number of hours on any project. Australian Pump says that the use of the turbo lance with their high pressure water blasters results in huge savings of time, water and energy. Both professional brick cleaners and roof restoration contractors have discovered the many benefits of using this combination in their projects. While the turbo has had a dramatic impact on the cleaning industry, not all users of pressure cleaners understand the advantages. When companies can invest $3,000 in buying a 4,000 psi heavy duty Honda powered pressure cleaner, they should realise an additional $300 spend on a turbo will double its effectiveness and reduce time spent doing the job by half. Lorenz comments that companies can get their cleaning jobs done faster, cheaper and with minimal use of resources such as fuel and water if they invested in the turbo accessory. Aussie Pumps’ ‘Turbo Mania’ catalogue, which illustrates how turbos work, their advantages for professional users, and how to select the right nozzle size for specific machines, is readily available from Australian Pump Industries.